Divorce can be seen as a self centred action. It mostly occurs according to this author because either one or both parents feel they can in some way lead a better life with a different or better spouse at some time in the future or no spouse. A study by Brinig and Allen published in 2000 found that awarding of sole custody to mothers incentivised mothers to file for divorce. The willingness of an exit intending spouse to co-operate and compromise to resolve differences depends on how much they see their life will be better for THEMSELVES with no spouse or a different spouse. Sadly the impact of divorce and re partnering on the children, is a secondary factor taken into account by many exit intending spouses. Many spouses intending to separate and divorce in modern western societies underestimate the severity of the modern divorce process. Marriage is one of the few legal contracts that you can make in modern life where one party can unilaterally terminate the contract without any penalty as Zimmermann has written extensively about. There has been much research to show that children need both parents in their life to reach their full psychological and developmental potential. Sadly a surprisingly large number of parents have been known to take young children far away from their home without the approval or knowledge of the other parent so they can never see that parent and that side of their family again. This is known as Parental Abduction which is a non legal form of Parental Alienation. A leading case on Parental Abduction is: Footprints in the Snow – case of children that disappeared with no evidence other than footprints in the snow for 944 days ! The sentencing of Sandra Grazini to prison for poisoning the minds of two of her children against their father and depriving them of 2 ½ years of schooling and contact with their siblings, father and extended family. One of the Ten Commandments states that all children must show respect for their parents. In most religions and traditional societies the love and respect someone must show for both their parents is lifelong and must be unconditional. Today if one parent can somehow show the other parent was bad or even not such a good parent, people seem to accept that the child ought not to respect that parent. In previous generations such ideology never would have seen the light of day. The modern ideology has shifted so far from the traditional ideology that people today accept that any allegation regardless of whether it is verified or not is deserved punishment of the alleged bad parenting behaviour of that parent. There is seen to be little need to verify whether or not the allegations are true or perhaps fabricated maliciously. Even if a child has been known to have been coached to simply say they dislike one parent that is enough to erase that parent out of a child's life. The child's deep emotional, psychological and developmental need to have both parents in their life is totally disregarded. We accept as quite normal and the right thing to do when the children of murderers go and visit that parent in prison yet we either see nothing wrong or act as bystanders with modern laws that deny hundreds of thousands of children of divorced parents in Australia from having contact with one of their parents. Most/all psychologists such as Dr Richard Warshak tell us that children are not born to hate and must be taught to hate especially when the object of hate is a child's parent and other relatives. 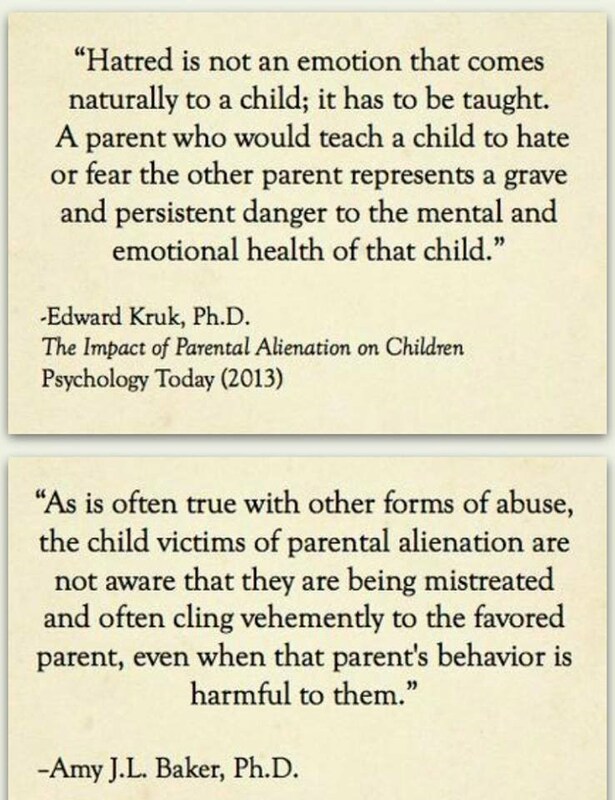 The expert Psychologist's who write about Parental Alienation all say that when you teach a child to hate one of their parents it is teaching the child to hate half of itself causing psychological damage. Picture Edward Kruk & Amy Baker Hatred has to be taught. In our society there is a paranoia to respond to unsubstantiated allegations of physical and sexual abuse by one parent against the other parent. The response by our government and legal systems often results in the short or long term erasing of a parent out of a child's life. There is no interest to look at the research published by the American Psychological Association that demonstrates that children who are psychologically abused face similar and sometimes worse mental health problems as children who are physically or sexually abused. Dr Amy Baker did a study on the long term effects of Parental Alienation on 38 adults who had been Alienated from one parent as a child which revealed seven major areas of impact: (1) low self-esteem, (2) depression, (3) drug/alcohol abuse, (4) lack of trust, (5) alienation from own children, (6) divorce, and (7) other. Half of these adults were alienated from their own children. This study is well worth reading as the information has been directly obtained from the victims of Parental Alienation themselves. The process of divorce is very destructive. The spoils of victory are awarded to the spouse who follows the carrots laid out by the system to reward what most people would regard as self centred behaviour. The children sadly become the collateral damage. Imagine the damage to a young child's mind of a parent who makes false claims of abuse such as below. The Psychological damage is magnified if well meaning friends and relatives repeat the same false allegations (not knowing they are false) and the parent replicates the abuse with other false allegations. HE POISONED MY DAUGHTERS ICECREAM ! A major study into Adverse Childhood Experiences was conducted in the mid 1990's of over 17,000 people in the USA. The study demonstrated an association of adverse childhood experiences (ACEs) with health and social problems as an adult. There have been more than 50 scientific articles and more than 100 conference and workshop presentations that look at the prevalence and consequences of ACEs. A study of 118 children of divorce found those with PAS achieved: substantially lower levels of achievement than the non-PA group, which was demonstrated by fewer college degrees, less overall employment, lower college enrolment, and more economic hardship. They also exhibited attachment issues, impaired relationships, and decreased self-esteem, possibly as a result of the lack of attention they received from their AP's. The controlling behaviour of an AP was also shown to increase feelings of anger and guilt in the PA participants. These emotions, coupled with diminished self-sufficiency, elevated the risk for depression in the children who were exposed to PAS. The above video's explain some of the impact of parents fighting and Parental Alienation on children at school. Under the AB-PA model of Parental Alienation by Dr Craig Childress and the Richard Gardner model of Parental Alienation, the children affected exhibit Narcissistic Personality Disorder behaviours. Most of the academic Psychologists who write about Parental Alienation explain that Alienated children have a deep down yearning to reach out and be connected to their Targeted Parent. They cannot do this because the Alienating Parent has conditioned them that if they do this they will reject the child. These children have already lost one parent and don't want to loose another. The experts tell us that for a child loosing a parent through Alienation it is as if the parent had died, however is psychologically much worse because the trauma is ongoing as the child knows (usually) that the parent is still alive. The numbers of boys in this age group who commit suicide is 2 ½ times more than girls. 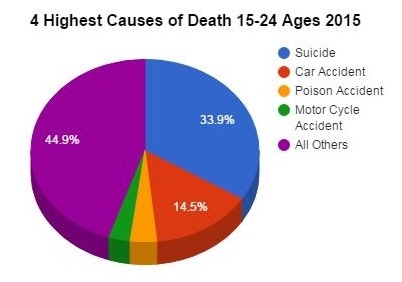 As you can see suicide causes way more deaths than the other 3 main causes of death combined. -peer reviewed study published in highly reputable journal. Girls had a 21 % overall higher mortality rate living with one parent compared to living with both parents whereas boys had a 54 % overall higher rate. The study estimated that based on the risk of mortality of children living with both parents that between 52 and 168 deaths could have been avoided (Lancet pp 293-294) if all the children lived with both parents over the 9 year period. If the same approach was used on the Australian population of 1.1 million children living with only one of their parents the saving in lives would be between 878 and 2,839 lives, or between 97 and 315 lives per year. This averages to 4 children per week. An Australian study by the Telethon Kids Institute found that, compared to children living in original families, children in one-parent, blended, and step families experienced a higher prevalence of mental disorders. Dr Karyl McBride has analysed the children of parents with Narcissistic Personality disorder and found that it is is an extremely destructive disorder affecting them badly in many ways. A study by Abajobir & Scott found that Australian children who are physically and emotionally abused are 10 times more likely to develop psychosis as young adults. 63 % of youth suicides are from fatherless homes. 90 % of all homeless and runaway youths are from fatherless homes. 85 % of children who exhibit behavioural disorders are from fatherless homes. 71 % of high school drop-outs are from fatherless homes. 70 % of youths in State institutions are from fatherless homes. 75 % of adolescent patients in substance abuse centres are from fatherless homes. 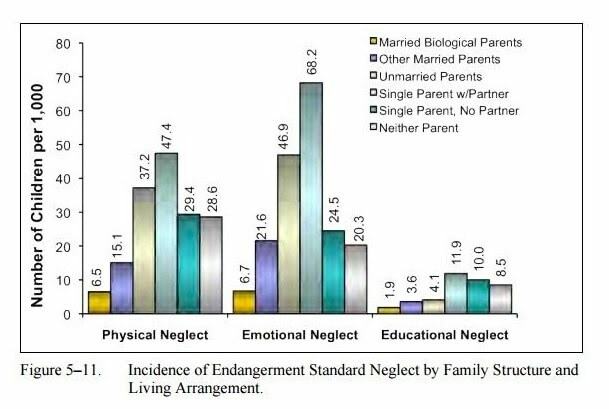 A longitudinal study carried out by Dr Martin Richards from the Centre for Family Research at Cambridge University of 17,000 children from birth until the age of 23 found that divorce significantly impacted children on so many developmental measures wheras death of a parent had no significant affect on many of them. Other studies have looked at the damage to a child's DNA from living without a father. An Alienating Parent will often saturate their children about all the negative aspects of the other parent. This makes the child feel bad because they are effectively hating half of themself. Gender is something many of them hone in on, so if the Alienator is a mother she will portray all males as terrible. If one of her children is a boy this will have a significant psychological impact on him. The impact will also be negative on a female child if the Alienating parent is a father. 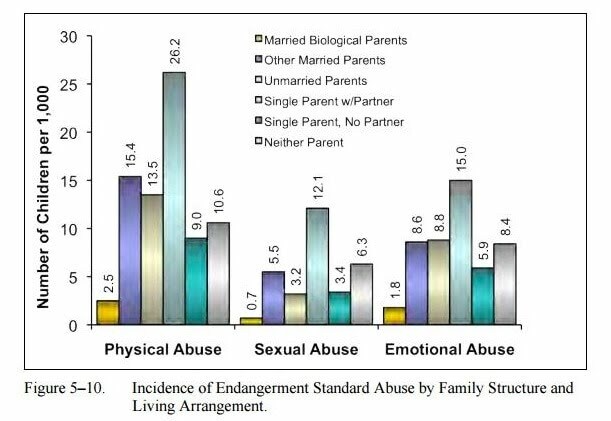 Psychologist Dr Richard Warshack has done lots of studies comparing the impact on different genders of children of sole custody mothers and sole custody fathers dating back to the late 1970's. Dr Warshak's studies show that children generally do worse if they are in the sole custody of the opposite gender parent. Motivational speaker Neko Cheri writes a long blog post of the harm she sees single mothers cause to their sons. Despite Mrs Cheri's Facebook video detailing only a fraction of the issues of the blog post, it has attracted millions of views and tens of thousands of shares. Based on the replies to her blog post, Mrs Cheri's concerns seem to resonate most to the black ethnic group which are severely impacted by the problem of fatherlessness. The US Government website https://www.fatherhood.gov/content/dad-stats website gives lots of references to the large amount of studies done that demonstrate that children do better academically in intact and separated families when their father stays involved in their education. For further information about the damage to children from Parental Alienation and growing up without a second parent follow the links suggested on the Links page of this site.